Presented by Chris Smith, Kat Arney, Kate Lamble. Have you ever wondered where use of gestures to signal our intentions comes from? Well, humans aren’t the only animals to do this. Victoria - This is about chimpanzee communication and it's not about vocalisations. It's about the gesturing that they do. So, this is a team from St. Andrews University up in Scotland, but they are spending time in Uganda at their field site at Budongo National Park, following two habituated groups of chimps. Habituated, just meaning they are wild, but they're used to having human observers around and they've just followed them tirelessly for hours and hours, on months long fieldtrips, watching their interactions. What they're saying is that they've got a distinct number of different gestures that they use to communicate. So, things they do with their bodies, and their faces, holding their feet up, stomping their feet, moving their hands in particular ways. And now, they've moved that further on to say in this Current Biology paper that there are 19 distinct meanings to that lexicon of 66 gestures. Chris - Are these chimpanzees doing this because they're habituated to people? Do you think it's that they've learned some of this off the people who are watching them or are these clearly just chimp behaviours? Victoria - Well, what the researchers try to do is keep their distance and just be observers. They don't interact with these chimps. It's very important to them for their biology that they're studying wild behaviours. So, what they're looking at is interactions just between the animals. They record hours and hours of footage but the only ones that they analyse are when a chimp elicits the attention of the chimpanzee that they want to gesture to and then they make their gesture. What the researchers have done is look at these interactions. When the change in behaviour from the chimp that's being gestured to, seems to satisfy the chimpanzee that's doing the gesturing, that's what they're saying is the meaning. Chris - What sorts of things are they communicating with these gestures? Victoria - A few other biologist that I spoke to while I was covering this story actually have said, some of these meanings are quite vague and quite simple for such a highly sociable and very emotionally complicated and very intelligent animal. We've only got 19 distinct meanings to 66 gestures. So, a lot of the gestures appear to have multiple meanings, they're saying. So, things like a parent will present its foot to its youngster to say, "Okay, you can climb on me and have a lift and I'll carry you." Females will do this thing called 'leaf clipping' where they'll very loudly and obviously nibble and take small bites at a leaf, and that's to elicit sexual attention. That's a very specific type of communication. But lots of things like arm swinging and pulling a play face, basically kind of opening their mouth, the kind of big welcoming play face. Punching even, foot stomping, even somersaulting, these very athletic tree climbing animals seem to have lots of different meanings. So, they basically put together almost a table in this Current Biology paper of what each gesture seems to lend itself to. So, there's a list of these 19 meanings from, "move away" "stop that" "give me that" "I want some", to "climb on me" or "I'm interested in you as a potential mate". Chris - Where did they get the gestures from? Did they learn them off their parents or are these innate? If you took these gestures to chimpanzees that don't live in this particular community in Uganda and showed the gestures to other chimp troops, would they respond similarly? Do we think this is a universal language, if you like? Victoria - That's a very good question because obviously, their social connections are so tight. These are communities of chimpanzees. They raise their children together. They share from watering holes. They share food. They're very sort of communal in their living. And so, they're so closely connected that this might be something they learn as a specific social group. Having said that, the researchers are studying two different social groups although they're in the same national park and potentially do cross into each other's territory. So, they're very, very close by. But we don't know yet if it's a universal language, just because this study comes from these specific groups at the Budongo National Park in Uganda. So, that's a big question and another sort of challenge for field biology in that, how on Earth do you study that because you can't really look at social interactions between chimpanzees in the wild that don't know each other and would never have any other contacts. Chris - Do any other great apes of close relatives - bonobos are also very similar to us. Do they do this? Victoria - I think bonobos, we've seen a lot of gesturing and a lot of very, very social and emotional interactions in observations of bonobos as well. So, it's likely, yes. We don't have this kind of lexicon breakdown, but that's just purely because nobody has written the paper for what bonobo gestures actually mean. But there's a lot out there of observational studies of bonobos hugging each other, using kind of empathic social interactions to comfort each other and that seems to have intentional meaning as well, and they're clearly very highly intelligent. 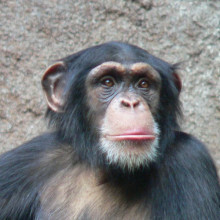 What these researchers are saying is that actually, chimps are sort of a special case. They're more closely related to us than they are to any of the other great apes. So, they're an amazing case in terms of evolutionary biology to look at and find the patterns of the development of language and gesture and communication, and social interaction that will give us clues as to the evolution of our own. Rising carbon dioxide levels might not just cause increased temperatures worldwide. 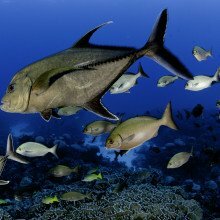 It might also hamper the abilities of fish to find their friends, in other words fish from the same species might not be able to group together and fend off predators. Lauren - Previous studies in solitary fishes have found that elevated carbon dioxide interferes with the functioning of neurons in the brain. Basically, neurons work by sensing concentrations of compounds in the blood surrounding them. And so, the changes in the ocean water are affecting the concentrations of those compounds in the blood. And so, it's changing when different neurons are being turned on and off. This disruption affects many parts of the body and particularly sensory abilities like sight and smell, which are both really important for recognising familiar fish and the ability of fish to swim away quickly from a threatening stimulus. So, what would be a predator. And they really aren't doing that very well. So, they're reacting slower or if at all. So, it's just more likely that they're going to get eaten. Chris - So, if there were a very high level of CO2 in the atmosphere from whatever source, this could get into the water that the fish live in and in turn change the acid balance of the water which in turn would impact on the fish. Lauren - So basically, humans are releasing a lot of carbon dioxide into the atmosphere. As the concentration of carbon dioxide in the atmosphere goes up, the ocean is going to absorb a lot of that. So that increased carbon dioxide is going to affect the chemistry of the water which is what is that keyword 'ocean acidification' that people discuss. Chris - So, how were you trying to study this? Lauren - I collected schools of fish on coral reefs. I brought them back into the lab and then I changed the chemistry of the seawater to mimic what we expect to see in the near future. And then we put the schools into this altered seawater, which mimics what we will see by the end of the century. And we had them stay in that seawater for a period of about a week's time. Studies have shown that it's a good amount of time to look at the effects of carbon dioxide on behaviours. Now, after we had let them hangout in this altered seawater for a week, we tested them in something called a 'choice test'. So, we gave them the choice between a school composed of their friends and a school composed of strangers. They were actually able to distinguish and preferred to school with their friends under normal conditions. But when they had been experiencing this elevated carbon dioxide level, they weren't able to distinguish anymore which school was their friends and which school were the strangers. Chris - So, if we extrapolate what you've seen in the tank to the ocean proper, what would be the implications of this then and what sorts of fish would be impacted? Lauren - It's actually over half of all species in the world's oceans school at some point during their lives, including many economically important fish species. And so, what we'd need to further understand is how the tradeoffs of group living are going to change if the benefits of living with friends is lost? So, I think there could be a range of effects, but I think we really need to do more research to find out what those effects might be. Chris - Did you study a different range of fish species or could this just be one particular kind of fish that does this? Lauren - I just looked at one species, but these effects on the sensory abilities. So, the ability to see and smell and the ability to make decisions properly. That's been done in a range of species. So, what we're finding is that the effects are really felt throughout a range of species. So, it'll be really interesting to do more work in the future and look at a range of species and see how species-specific these trends are, so if some species are more tolerant than others. Chris - Talking of being tolerant, do you think this is something which fish can adapt to because we're not going to see the levels go from where we are today to the levels we expect in a hundred years time overnight? It's going to take until the end of the century to get there. So, your experiment is a little bit artificial because you have literally put the fish in at the deep end, straight in at these very high carbon dioxide concentrations. They would have up to 100 years to get used to this wouldn't they, normally. Lauren - That's a great question. That's actually a topic that's been really looked into at this time. Previous studies recently have found that some traits can be acclimated to in as little as two generations. So, with some of these behavioural and physiological impacts that I've been discussing, you know, improved in a really short period of time. However, the ability to improve these traits over the generations has been absent in some of the traits. So, it's really important to do more work in terms of this longer term acclimation, to understand how fish populations may change in the future from these environmental changes. Around 400,000 people around the UK are affected by Type 1 diabetes - a condition where the immune system attacks their pancreas, destroying the cells that make insulin, the hormone that regulates blood sugar levels. 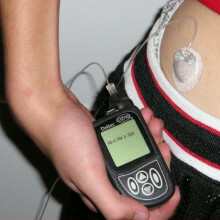 People with Type 1 diabetes need to monitor their blood sugar levels throughout the day and even during the night, and inject themselves with the right amount of insulin when it's needed. It's an effective treatment, but it's cumbersome. Domenico - A couple of years ago, we made a rather serendipitous observation that we could trick cells in the gastrointestinal tract, in the gut, to start doing what insulin producing cells in the pancreas normally do. And that is to turn into an insulin factory. It was an exciting observation, but it was made in laboratory animals. And so, we did not know if this had any clinical application. Kat - So basically, you're tricking cells into turning from gut cells into pancreas cells. Kat - To make stuff. Domenico - ...to make stuff and to secrete it. We're simply retraining it, if you will. Kat - So, you've made these discoveries in animals in the lab. How are you now trying to take this forward to humans? What's the new discovery about? Domenico - The next step in this research is to make a drug that could be administered to patients and do what we've done to patient cells in the test tube and is described in the study. It's to develop an inhibitor of the gene that we targeted as the key regulator of this process and produce it in a formulation that would be effective as a drug to be delivered to a living individual with the disease. Kat - So, this is kind of a molecular re-trainer, a drug that can retrain these cells. Domenico - That's right. We know that if we could administer to people the same reagents that we've used in the test tube, they would probably do so. But the one important caveat is that what we've used in the test tube is not safe for use in humans. And so, we need to change the way in which we approach this a little bit, in response to the appropriate cues. Kat - So, the technique that you've used, is that the kind of thing that could work in patients? Domenico - Yes. One of them would certainly be applicable to human beings. In fact, variations of this technique have been used to cure macular degeneration in the eye or they're used to cure elevated cholesterol levels to reduce elevated cholesterol levels and prevent heart disease. Clearly, one of the approaches would be applicable to human beings, with patients with type 1 diabetes. Kat - Now, there are probably many of our listeners who either know someone with type 1 diabetes or maybe have it themselves and although insulin injections are very effective, it's something that's a lifetime of medication and the health problems that go along with that. I'm sure people are going to be wanting to know, how soon can we get this? Where do you see this going? Domenico - I don't want to give any false sense of hope that we're going to come up with a treatment tomorrow. Treating type 1 diabetes requires that whatever we propose as an alternative to insulin be as safe and as effective as insulin is, just more practical. We can't go out on a limb with something of unproven safety or efficacy. I know that especially the type 1 diabetes community has become understandably a little bit jaded by the constant drumbeat of new discoveries that promise to turn their lives around in a dramatic fashion. The next step will take us probably 18 to 24 months to come up with a chemical substance, a chemical entity that could be tested at least preliminarily in humans. And so, it's not going to be another 10 years. It's not 6 months, but it's an ongoing effort that we're trying to press on with this rapidly and effectively as we're able. Modern-day Tibetans may have our ancient ancestors to thank for handing onto them a gene that makes it easier to survive at high altitudes. Paul - Researchers have looked at the genes of Tibetans and found that they have this protective gene against altitude sickness and furthermore found that this gene comes from an extinct species of human that was alive tens of thousands of years ago, but is no longer with us. But we know that our ancestors bred with this extinct group called the denisovans as they came out of Africa about 60,000 to 70,000 years ago. All they have, all that remains of the denisovans is one very large tooth and one very small finger bone (it's a pinky bone) found in a Siberian cave near the Altai mountains. But because of the good preservation of the tooth and the finger bone, they were able to get very good DNA sequence out of it. The denisovans have been described as a genome in search of a fossil. We don't really know who they were. We've only got these fragmentary remains. But they're so different from both our ancestors and us today, modern people, and also from the Neanderthals that people know they were distinct species. And they probably existed across a wide range of Asia. Chris - So, these denisovan people had come out of Africa before we turned up and they were there across bits of Asia, and effectively waiting for more modern humans who then came out subsequently and then as you're saying - we now realise - interbred with them. Paul - That's right. So, there were several waves of people who left Africa about 2 million years ago and after that. We think the denisovan's ancestors probably came out about a million years ago. They moved into Europe and Asia and perhaps Southeast Asia and Oceania. They were probably thriving in that area across a wide range until about 40,000 or 50,000 years ago. And then after that, we don't really know. We don't have a good handle on what happened to them. 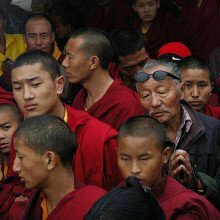 Chris - So, what is the gene that the researchers have found has been transmitted between the denisovans and our ancestors, and subsequently our modern Tibetans? Paul - Yes. Well, the gene is called EPAS-1. It has a variety of functions, but it mainly affects the molecule, haemoglobin in the blood, the oxygen-carrying molecule. The variant that's in Tibetans causes a range of responses when the body is exposed to hypoxia - essentially low oxygen. Now, in people who aren't adapted to high altitudes, what will happen generally when we go up to high altitudes is that we'll produce a lot more red blood cells. But what we tend to do is we produce too many of them. We over compensate for the hypoxia, the low oxygen levels at altitudes. This can place us at risk of altitude sickness, if over an extended time, stroke, and in pregnant women, pre-eclampsia. But in Tibetans, the variant they have of this gene doesn't produce as much of the red blood cells. So, their blood remains thinner at high altitudes. So, they're better able to cope than perhaps other populations. Chris - So, do we think that the denisovans all had this particular gene variant? Or do you think that just some evolved to have it and then those modern humans who happen to overlap with the denisovans in that area inherited it because it gave them the same advantage that it would've given the more primitive denisovan humans who were living there? Paul - It's a very interesting question and we've only got one denisovan genome. So, it's unclear whether this was widespread through the denisovan population, or whether it was just there at low levels, waiting to be acted on by natural selection, which it clearly has been in Tibetans. Denisova cave isn't that high. It's about 760 meters above sea level, but it is near the Altai mountains. It's surrounded by mountains that are much higher and go up to much higher altitudes. So, it's possible that there was an adaptation in the particular denisovan population that was living there. We certainly know that other people who passed through the area and are part of the same ancestral group that perhaps contributed to Tibetans today don't have those genes. Those people also lived at high altitudes. For example, some of the peoples in America don't have this gene, yet live at high altitude areas in the Andes and so on, and have adapted in different ways. So, it's unclear why this gene first passed only into Tibetans. According to a new study, we humans really don't like to be left alone with nothing to do other than think. 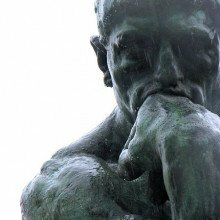 How long could you be left alone with your thoughts? 10 seconds? A minute? According to a new study, humans really don't like to be left alone with nothing to do other than think. In fact, when participants were given the choice of thinking for up to 15 minutes or giving themselves a painful electric shock, 67% of men and a quarter of women would rather electrocute themselves. Timothy - Everyone was asked to take a sample electric shock to start with and it was kind of like a severe static shock. Then we asked people to spend - in this case, it was 15 minutes, just thinking, but we told them that if they wanted, the shock was still available and if they could just press a button they'd get it again. I have to say, we had no idea what to expect. I mean, there were some of us on our research team who said, "Why are we doing this? No one is going to shock themselves." But many people did, especially men, they seem to want to shock themselves out of boredom so to speak. Graihagh - Why? Why would you choose to give yourself an electric shock? Timothy - I do think the human mind evolved to engage in the world. It's kind of disconcerting to have nothing to do for even that short period of time. Some people just found it too difficult to sustained line of thought and wanted some sort of external stimulation. The men were more likely to give themselves a shock. It was two thirds of men and a quarter of women gave themselves at least one shock. It varied. There were some who just gave themselves one and some 3 or 4 or 5. We did have one man who pressed the button 190 times much to our surprise. I think given the nature of our shock apparatus, I'm not sure that he actually got 190 shocks. Graihagh - So, given this, why is thinking so unenjoyable? Surely, it's a part of normal people's lives. We daydream perhaps when we're finding something a bit boring. So, why is it so unenjoyable? Timothy - I don't want to exaggerate this. I do think that all of us in our daily lives as you say, we do find our minds wandering to pleasant topics. I think what's hard in our studies is doing this on the spot. It's kind of hard to turn it on and off, to keep one line of thought going for that long. Maybe if people had just a little something else to do that it might actually free up their minds to think about other things because when people tell us they enjoy thinking, often, they are doing something else like walking or driving, or exercising. So, maybe the difficulty is, that when the mind has absolutely nothing else to do, it's just an uncomfortable state. 24:48 - How much energy do cyclists use? 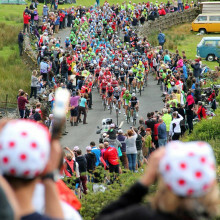 The world's biggest cycling event, the Tour de France has just visited Britain. 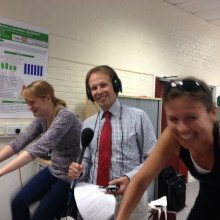 To celebrate, we thought we'd take a peep behind the yellow jersey to find out the science behind the Tour de France; so Kate Lamble and Chris Smith headed down to Anglia Ruskin University, to the Lab of Sports Scientist and former Paralympic cyclist Dan Gordon so he could push them to their limits. Dan - I was a track cyclist so I used to do kilometre time trials and sprint cycling on the velodrome. Dan - I've got a few, yeah. I was European champion, I was a world champion, and I still hold a world record. Chris - So, tell us about the laboratory we're in and the work you do here at Anglia. Dan - Yeah. This is one of our exercise physiology laboratories and we're equipped here for assessing everything from cardiovascular, cardiorespiratory function through to what's happening in the blood and what's happening in the muscles. Chris - You've agreed to do some experiments for us today. You're not going to do the cycling, but we're going to make Kate do some of the cycling and you've also brought along a volunteer. Who are you? Karin - I'm Karin and I'm a sport scientist student here at Anglia. Chris - And also a keen cyclist. Karin - A keen cyclist, a keen runner, and a keen spinner. Chris - So Dan, what are you going to do with our two victims? Dan - Okay. What we thought we'd do is we would get these guys to experience what it's like to cycle in the Tour de France. There's a lot of data now that's been collected over tours in terms of what the amount of work that these cyclists are doing and we measure the work on the bike through the crank that is the bit where the pedal is connected. 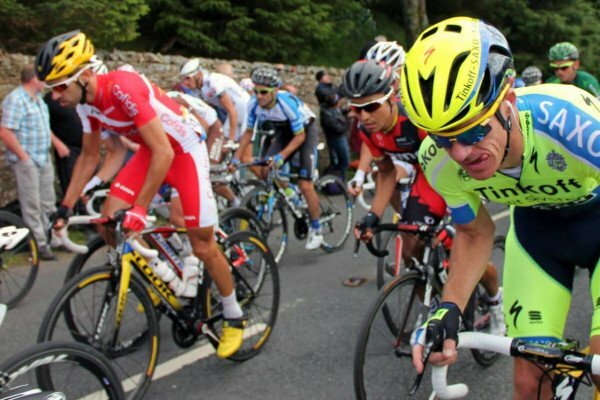 We know that in the males who are competing Tour de France, they work at about 7 watts per kg. So, it would be a bit unfair to make both Kate and Karin work at the same workload as somebody like Bradley Wiggins. So, we've looked at what's called the Tour Feminin. So, this is the female version of the Tour de France. In the female version, they're averaging about 3.3 watts per kg. So, this means that in this demonstration, Kate is going to cycle at 135 watts and Karin is going to cycle 175 watts. Chris - So, this is based on their body weight. Dan - It's based on their body weight and they're going to maintain the cadence, that is the rate at which the pedals go round. And so, we know that the average cadence across the 21 days is 70 revs per minute. So, we're going to get them to try and maintain that and then we're going to look at partly how long they can go for and also, we're going to try and record some heart rates to get a picture of what the cardiovascular response is. Chris - And just to be clear, when you say 70 revs a minute, what does that translate into in terms of speed over the ground for the cyclist? Dan - If we take the 21 days as a whole, it does depend upon the year of the tour. It does depend upon how many mountain climbs they've got, but it ranges anywhere between 42 to 44 km an hour. Chris - You up to it, Kate? Kate - I'm beginning to regret this entire endeavour if I'm perfectly honest. Chris - Do you want to come and set them up Dan? Talk us through how we're going to do this. Dan - Karin is already on her cycle ergometer. So, she's adjusted it to her body position and Kate is going to now jump on and what we're going to ask them to do, is if you guys just want to gently start turning the pedals. This is Kate's wattage about to go on. So, we're going up from 50, to 90. Chris - So, this is an electronic selector. We can see the scale going up. Wow, it's quite 128, 130. Dan - So, we're at 135. Chris - That's quite a heavy load you've got on there. Kate - Yes. I don't know why Dan decided to make it so hard for me, but I'm currently managing it. I'm on about 80 revs a minute. How fast is that compared to the Tour Feminin, Dan? Dan - You're averaging a little bit faster. They're averaging about 70 revs per minute. But if you're comfortable at 80, I would say, stick at 80. So, what we'll do is we're going to measure Kate's heart rate while she's doing this. Okay, so if you want to give me your finger. I'm just going to put this little Doppler on the finger. So, Kate is currently working a heart rate of about 150 beats per minute. Kate - That's really unfit. Is that unfit? Chris - That's quite high, isn't it? Dan - That's relatively high, but bear in mind that Kate has only just started. So, the heart rate will accelerate quite quickly initially. We would expect riding on a flat stage. The heart rate can be anywhere between 119 and 130 beats per minute for about 6 to 7 hours. Chris - So, let's see how Karin is getting on. Are you feeling alright? Karin - Yeah, it's a little bit tough, but I'm still alive. Chris - Let's have a look at Karin's heart rate. A much fitter, 132. Dan - So, there you go. So, you've got this comparison. So, Karen who does a lot of aerobic exercise, cardiovascularly, she'll be strong and she'll have a slightly bigger heart. She'll be able to use the blood and the oxygen that's in that blood more efficiently at the muscle. As a result, she's using less energy for every time she pushes down on the pedal. Chris - How long are we going to subject them to this? Dan - As long as they can go for I think. Kate - I'm beginning to feel like this is just an exercise embarrassing me, this entire show. We've had British winners in the Tour for the past two years now and Chris Froome will be trying to make that three this year. These successes are, at least in part, down to the unique approach taken by Team Sky coach, Dave Brailsford. He targets so called marginal gains, saying "If you broke down everything you could think of that goes into riding a bike, and then improved it by one percent, you will get a significant increase when you put them all together,"
One of those one percent's is a riders air resistance and so Kate Lamble visited the University of Southampton to meet Stephen Turnock director of their Performance Sports Engineering Lab, and to have a go in the wind tunnel which the likes of Wiggins and Froome use to perfect their racing position. Kate - It used to be that who would win the Tour de France was decided on the slopes of a big French mountain like the alpe d'huez. 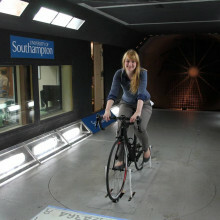 But nowadays, it might be that those decisions are made instead here in a wind tunnel at the University of Southampton as more and more cycling teams are turning to scientists to squeeze every last bit of speed out of their riders. I'm joined here by Stephen Turnock. We're in this big cavernous black space with a very lonely racing bike in the middle of it. Who comes here? Stephen - We've had all sorts of sportsmen and women in here, mainly through UK sport and the connection with the British cycling team. Primarily, it's about finding their best position on the bicycle, the one that means they need to use the least energy possible to go through the air. Kate - So, I can tell when I cycle to work every morning that the wind and the wind speed will affect how fast I can go and whether I'm struggling just to get over those miniature hills in Cambridge. How does the wind affect racing cyclists who are doing it properly? Stephen - It's the simple physical law that the faster you go, the higher wind loading will be and it's basically a square law for drag and a cube law for the power. So, if I go twice as fast, the wind drag I get from my own speed is 8 times the amount of power I need to go that fast. So, if I then get a headwind or a following wind then that's going to either mean I have to work harder or I have to work less to go at the same speed. Kate - Is it just because I'm having to push the air in front of me out of the way and the faster I do that, the more difficult it is? Stephen - Effectively, yes. What your body looks like to the wind or the relative wind you get once you're cycling and you've got the wind against you will change what the fluid dynamics does. Hence, what the pressure load is on you and how much force you need to go through. Kate - So, how does this space help us measure it? We've got a massive turbine fan at one end of the room and what looks like a sort of black hole at the other end of the room, and a very lonely bike in the middle. We obviously can't get the bike in motion. How do we tell how much drag is going on without the bike being able to move? Stephen - So, the wheels of a bike are spinning on a device that puts a relevant amount of force back to you, so you feel like you're cycling. And that whole system is sitting on a dynamometer which measures the drag force. Kate - Can we have a go? Stephen - By all means, yes and see where your elbow should be put. Kate - The final door has been closed and I'm genuinely a bit terrified about whether I'm going to embarrass myself in front of all the technicians that are staring at me through the window. My drag and my power, and my calories and my time has just appeared in front of me and they're just going to take a zero value before the wind kicks in. So, you can hear the wind gushing away there. It's been turned on for the first time, certainly getting a new hairdo at least. So, in front of me, it takes a few seconds average of the drag and the power at one time. So, if I sit up large like I'm on one of those sit up and beg bikes, we can see the drag hitting an average of about 30 Newtons, but if I move down onto the drop handle bars like you would on a racing bike, then the drag drops down immediately to under 20. So, that's 10 Newtons difference in drag even though, because I'm getting a bit tired, my power is dropping off. It's actually making quite a big difference how I can feel when I'm pedalling along. So, I'll ask the guys how much 10 Newtons in drag difference might change over a long race. See, already out of breath! So, you can hear in my breath, so I'm still slightly recovering from that, but when I was sitting up on one of those sit up and beg bikes, I was on about 30 Newtons of force and when I was on the drop handle bars, even though I'm holding a recorder and microphone, that dropped down to 19. So, that's 10 Newtons of difference. How much difference would that make for a rider in a race? Stephen - So, it's an example. They would unlikely to find such big changes in their posture because most of them have learnt over the years what a really good posture is. However, the beauty of coming in something like a wind tunnel is you can find the small changes. You can't actually perceive them when you're cycling, but when you're over the whole distance of a race, those small changes all add up and by the end of a race, you've got a margin which could take you from outside the medals to inside the medals. Kate - It's not just tucking in your body that I see cyclist do. You also see them obviously riding in a big group, riding in a peloton. But when there's a sprint, when they want to go really fast, teams tend to line up in a straight line with their sprinter in the middle. How much does riding in a line change things? Stephen - It changes things a lot because effectively, what you're doing when you're tucking in very close behind a cyclist in front is they're doing all the hard work for you. They're taking away the wind pressure on you and you could be working much, much less. So, when they're all riding in a big peloton, and they're all tucked in there, the lucky guys in the middle are not having to work very hard at all. They're just overcoming effectively the rolling resistance of their wheels. Kate - I do find when I'm cycling along and I'm sort of stuck behind someone I'm very cocky about like, "I can't believe you're going this slowly" until I overtake and realise how much work it is. Stephen - Exactly. So, everyone could sort of feel that. Kate - So, the person behind benefits from the person in front. Does it work the other way around as well? Stephen - Yes. There was a little bit of gain for the person in front. So actually, having two cyclists working together is actually beneficial for both of them and in an ideal world, they swap around every so often. Kate - That sort of seems counterintuitive that the person being sheltered from the wind would actually give a hand to the person who's sort of being the shield for them. Stephen - Effectively, it's because the person behind also changes the flow field on the person in front and that changes the pressure field around them and hence, the drag force on them. Effectively, you look like a larger, more streamlined object if you have a lot of people in a line, the one person on their own. Kate - All I'm hoping to see is lots of pelotons of cyclists across Cambridge who want to make their commute to work easier. After five minutes cycling at Tour de France Pace, both Kate and Karin are starting to feel the burn. Dan - They're done just over 5 minutes now. What we can see is, if we look at Kate, Kate has done remarkably well. Chris - You've actually done over 5 minutes at Tour de France pace. Kate - Well, Dan, before we started, said that he thought I could only do 40 seconds! So I went out to prove him wrong! I think 5 minutes is a respectable improvement on 40 seconds! Kate - That would be the payoff. Chris - Karin, how are you feeling? Karin - I think it's tough now. Chris - So, what can you tell us about the comparison between these two? Dan - So, if we look at Kate's state at the moment; so Kate is averaging at the heart rate of 167. Actually, it went up to 174 not long ago. So, if you remember early on, it was about 155. So, the fact the heart rate has gone up, but the workload hasn't changed is indicating that Kate now is having to use more energy to maintain the same pace. The energy is coming from sources that do not use oxygen and these are the sources that cost you, they're anaerobic. So, if we look at Karin now, Karin's heart rate is 145. It has gone up, but it's only gone up marginally. And so, that's what you would expect from somebody who's aerobically very fit and is able to push through the pedal. A lot of this is about the mechanics of pushing and pulling and we understand that pushing is comfortable, but actually, it's more efficient to pull up on the pedal and use less energy for doing that. And somebody who cycles a lot has got mechanics to be able to do that. Chris - Should we let them off now because I know you've got something else in store for them in a little while? Dan - Okay, I think we should let them stop. Okay, well done guys. Chris - You can stop. Defibrillator is in the corner if you need it. So Dan, what's the next trick we're going to subject them to in a minute? Dan - Okay, so next what we're going to do is what we looked at was the average cadence that's used in the tour. But actually, what researchers started to show us is that cycling is much more efficient at higher cadences. In fact, if we look at the world class climbers, they actually cycle at much high cadences. They cycle at cadences around about 110 revs per minute. So, what we're going to ask Karin and Kate to do is repeat what they were doing in terms, we're going to keep them at the same relative workload, but we're going to ask them to do it this time rather than at 70 rpm, at 110 rpm. The Tour de France has been running since 1903 only stopping for the two world wars. So how much have bikes changed over the last 111 years? Believe it or not, the Tour de France has been running since 1903, only stopping for the two world wars. So how much have bikes changed over the last 111 years? Chris - When did bikes actually get invented? Philip - Well, the one invention which really kicked it off was the idea of putting one wheel in the front of the other and then being able to steer one. That was in around 1817. Chris - That's really rather recent, isn't it? Philip - Comparatively, yes because if you think that the Romans and Greeks all had wheels, the idea of putting one in front of the other would seem possibly fairly obvious, but apparently not. Chris - The eponymous bike is the penny-farthing. That's got to be the most famous design. How did someone come up with that and why did they come up with that rather enormous wheel at the front and the smaller one at the back? Philip - If you look at the penny-farthing today, the whole idea seems completely ridiculous. They were dangerous. They were heavy, but actually, the whole idea was really quite logical because at that stage, we'd got to the point where the bikes with two wheels and there were also pedals, but the pedals were attached straight onto the front wheel. And if you do that, the only way you can change how fast you're going for a given speed of pedalling is by making the wheel bigger or smaller because there's no chain or gears or anything like that. And obviously, people like to go fast so the wheels got bigger and bigger. Chris - So, when did they actually invent the bike as we know it? Philip - So, the original idea happened in about 1817, but it took maybe another 70 or 80 years for it to get to something that we'd really recognise today. There were a series of key inventions along the way. There was the idea of pedals, tyres that cushion the ride, bearings that help wheels spin a little bit more easily, and things like chains and so on to just keep everything ticking along nicely. Chris - But is it fair to say that really, by the end of the Victorian era, we'd arrived at all of those sorts of inventions and really, bikes haven't changed in the last 100 years at all. Philip - Well, you have to be careful. By the end of the 19th century, in about 1890, an entrepreneur from Coventry had put together all the key components - two wheels the same size, a chain, brakes, and of course, pedals. And you see within 10 years of that, anyone and everyone's riding bicycles - there's pictures of Elgar riding a bike and things like that. But it would be of course wrong to say that nothing has changed since. One thing happens and is slightly improved, and so, after another 120 years of slightly improvements, we have a much, much better machine than we had at the end of the 19th century. Chris - Let's look at the tyres for a minute. What about the sort of impact of vulcanisation of rubber, the ability to actually make a tyre that wouldn't be solid, it could contain air because that was an accident, wasn't it? Philip - Well, there were a few things that happened there and this is one of the problems with invention. 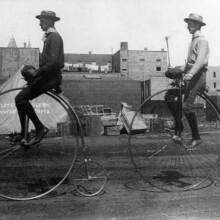 Pneumatic tyres like you have on a bike where they're filled with air were invented twice. There were a couple of reasons for this. Firstly, rubber is a very, very soft material when it's produced naturally. But for it to be useful for something like a bike tire, it actually needs to be quite durable. And so, this process of vulcanisation which was invented in about the mid-19th century was actually very important for that being possible. But someone had invented the idea of a tyre for a cart, long before bikes were really a thing. But it never really took off because the rubber wasn't quite up to it and bizarrely, no one ever saw the possibilities in the invention. So, it turned out when a guy called John Boyd Dunlop actually came up with the idea of using this idea in a bicycle and it took off and was very, very successful. He actually took out a patent to protect his invention. It lasted for 2 years before someone, looking back through the historical archives, realised that it had already been done, so he lost it. But was otherwise quite successful with his invention. Chris - What about gears and things like that? When did people come up with that idea and did they already know that the engineering and physics principles there or did that get invented for the purposes of cycling as well? Philip - Well of course, by the time the bicycle was really taking off, there were steam engines and huge industrial machines. So, the actual principles behind gearing are quite straightforward. But the problem you have with the bike is it's a machine that isn't really that well looked after. It's exposed to the elements and more importantly, it needs to be as light as possible. The tricky thing there was waiting for chains and the actual physical gears to be strong enough and reliable enough to really be usable on a bike without just getting ground away to dust every time you tried to ride it. It wasn't really until that 1910s, 1920s, 1930s, that proper gearing like we know today really became practical. Chris - Tell us to finish, why are bikes easier to stay up on when they're going along? Philip - Okay, there's a couple of effects that go on here. One is, as you go faster and faster, the wheels spinning have an effect that causes you to stay upright if you try and tilt them. So, that's really useful, but it's only noticeable once you're going at a reasonable speed, maybe above 10 miles an hour. And so, another reason is simply the fact that you're steering all the time and you tend to lean around the corners. Of course, if you lean around a corner, anyone who's been fast around a corner in a car will know that you tend to get thrown to the outside of the corner. So, if you're cycling in a straight line, you're not really cycling in a straight line. Your just cycling in a series of wiggles which all add together to make something that looks a little bit like a straight line. Certain cyclists, like climbers, train to pedal at higher speeds, especially uphill. But why is this actually easier? Dan - So, the next trick is we're going to look at the effects of cadence. This understanding that high cadences are theoretically more efficient and we know particularly the climbers like to use high cadences because it's much easy in terms of getting the force through the pedal when you're going up a steeper gradient. Chris - Why is it better to turn the pedals faster when you're under those conditions then, which is what high cadence effectively means, doesn't it? Dan - Absolutely. It's a great question. The key comes down to the amount of force that has to be produced. So, if you imagine that you're doing this slowly but we're still working at the same wattage then you're having to use more muscle or muscle mass to produce that force. But if we're doing it at a higher cadence but maintaining this same relative wattage then actually, the metabolic cost, the energy cost to the muscle is lower. Actually, most of the work then comes from what we call 'neural recruitment', how quickly you can get those muscles to lengthen and shorten. Chris - So, what should we see here and what are you going to ask the two of them to do? Dan - So, I'm going to ask them both to now cycle again, with the same relative workload, but this time, at 110 revs per minute. So, we're going here, 40 revs per minute higher than they were cycling before. So, this is those cadences that we see, as I say, things like team time trials and the elite climbers will use these kind of cadences. So, what we want them to do is try and maintain this and it would be very interesting to see what they start to report because they're not used to these cadences. I mean, Karin doesn't ride at these cadences either, but we know that athletes who train at these cadences start to become very economical and start to actually find them much easier to maintain than those lower cadences. Chris - It just seems strange to think that going faster is easier. Dan - It just seems counterintuitive, doesn't it? But it's certainly this idea that if you imagine the amount of time that pedal goes round, so the longer it takes for a pedal to around, you're using more energy. In the demonstration earlier on where we saw these heart rates starting to rise, it would be nice to see if let's say with Kate, the heart rate doesn't rise quite so quickly. That would be the anticipation. Chris - Okay, should we give it a go? Dan - We're going to start Karin off first. So, Karin starts pedalling and I'm going to put the resistance on. So, up goes the resistance, 175. So, Karin is now at the required cadence. Chris - How does it feel, Karin? Is it easier? Karin - No. I cannot say it is. Actually, it's not as tough as I thought it would be. Chris - So, it is in that respect. It is a bit easier. Chris - So, we're loading up Kate. You're aiming for 110? Kate - I'm not sure I can get. Chris - 110, there you go. And so, this would be about 40 km an hour, Dan, up a hill. Dan - Well, no. Up the hill, they would be going at a slower speed of course. The thing we have to take into account is that they're using different gearings when they go up a mountain. So, they can't be pushing the bigger gears, but it's the equivalent you may see for example in a team time trial. Chris - How are you feeling, Kate? Kate - Tired. I mean, Nairo Quintana who's the climber was my hero last year so I'm trying to channel a tiny Columbian man but it's not really working. Chris - Do you expect them to go much longer? Dan - No and partly because they're not used to this kind of work. Again, as we talked about earlier on, the way in which the muscle adapts training, so does the central nervous system. And so, the ability to recruit the muscle. They're doing remarkably well for this same workload. Chris - Are you nearly done? Kate - I'm really done. Chris - Okay, so you're done. How are you doing Karin as the trained cyclist? Karin - I'm sure you could forget the word 'trained' at the moment. I feells harder. Chris - This is kind of rush hour in Cambridge, you're doing here. Karin - This is worse than rush hour in Cambridge. Rush hour in Cambridge is just watching the other cars. Kate - About 4 million. Chris - 176. So, it's up a little tiny bit. Dan - So, it's up a little bit, but not much different to what Kate was experiencing when she was doing the lower cadences. So, let's try Karin who's breathing very hard over the far side. Chris - You've given up. Kate - I can't manage 110, I was just - you can see the number sort of sneaking down into the 90s and realise that you're not going to be able to get them up again. Chris - Karin is still going and we're just registering the heart rate of - wow, 110. So, that's actually lower than when she was at her peak which is exactly what she said. So, it does work. Dan - It does work although it looks and Karin feels like it's really hurting but actually, physiologically, she's using less energy. Chris - Should we let her off? Dan - I think we should. Chris - So, while they go and die quietly over there, what about at the level of the muscle? When you're doing this, when they're working out like this, when you're working very, very fast, does this also affect the blood flow through the muscle because if your muscle is not spending as long contracting, does this mean the blood vessels are open for longer so more blood can flow in and out? Dan - Absolutely. So, if you imagine that as the blood's going through, every time the muscle contracts, if it's at a slow rate, it's going to push down onto the arteries. It's also going to push onto the vein. So, if you're going at a slower cadence, those muscles can press in the arteries a little bit. Not completely but they can press it so they make it harder to push the blood through so we're having to use the high blood pressure. Because the cadence is higher, we're not maintaining it for so long, so as a result, we have lower blood pressure response, we get the oxygenated blood to the muscle more efficiently, and we're also able to get that carbon dioxide away as well. Cycling fans were devastated when Lance Armstrong was found guilty of systematic doping. But how can we prevent this in future? Despite it's long history, probably one of the darkest moments in the Tour's history is the seven years, between 1999 and 2005 for which the history books no longer list a winner. 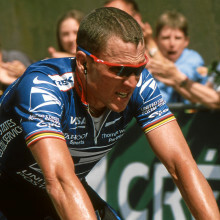 Lance Armstrong was stripped of his titles in 2012 after being found guilty of systematic doping by the International Cycling Union. To find out how organisations are now working to keep cycling and other sports clean through better drugs testing Kate Lamble caught up with the Director General of the World Anti Doping Agency David Howman. Kate - The most famous example, in recent times in cycling at least of someone who's been found guilty of doping, it was Lance Armstrong and he admitted last year to using the banned substance EPO and also to so-called blood doping. What do things like EPO and blood doping do? What does that actually mean? David - Well, I wish he had admitted it a little bit earlier than what occurred, but that's by the by. What the EPO does is provide more oxygen to the blood and therefore, enhance the way in which you can increase your exertion so to speak and it's the same sort of thing with blood doping. Kate - So, blood doping, as far as I understand it is when you remove your own blood before a race so you've got a higher red blood level count and then you inject it back in at a later time. David - That's one form of blood doping, yes and it's very hard to detect because you're using your own blood to put back into your body. The examples of using somebody else's blood or some animal's blood is a little easier to detect. That's occurred in the past as well. Kate - Now, Armstrong's defence for a long time was that he was tested as part of racing, more than 200 times and was never caught. Why would things like EPO and blood doping not have appeared on this tests? David - I could only guess and there maybe a number of reasons. One is that he had very clever doctors or scientists that were able to manipulate his system at the time or just before the time that he was tested. That's conjecture because it's not been proved, but we know for example that it is not too difficult if you're giving it advance notice of a blood or a urine test that you can so manipulate your urine or blood. We also know and Lance Armstrong was not the only one - Marion Jones for example is another one who never tested positive through her career, but cheated throughout. What we are trying to do is ensure that we do not rely solely on collection of blood and urine, and therefore, subsequent analysis of those samples, but also look at other ways of collecting evidence about how people are cheating. Kate - Two years ago when Armstrong's titles were withdrawn, I remember Pat McQuaid who, at that time was the president of the International Cycling Union, he said that the cheats were better than the scientists. Is that what anti-doping is about, just this long term race between people who want to cheat in any sport and scientists? David - I think I would liken it to the race in any part of our society where people want to cheat. And you can look at the same sort of issue with for example, plagiarism in journalism. It's never going to go away because people want to take shortcuts. We think there is a narrowing of the gap between those who are cheating and those who are trying to catch the cheats. And that has narrowed considerably since even Pat McQuaid uttered those words. But you'll always going to get people who are prepared to spend a lot of money. If you remember the amount of money that we've got at our disposal, we have about $28 million a year, that buys about a half a football player. Kate - So EPO, I remember it being talked about in cycling, a long time before a test was ever developed for it. How do you develop tests for drugs that you're not 100% whether athletes are using? David - Well, that's a scientific issue and we spend a lot of money on research and that research takes a while because at the end of the day, when you are putting together a detection method, you have to be pretty close to 100% sure it's not going to produce false positive cases. The EPO test was looked at way back in the 1990s and it took 5 or 6 years before scientists could agree as to what sort of approach could be used. If you remember in the Sydney Olympic Games in 2000, there was a urine/blood approach suggested and it took quite some time before there was a settled test for detection of EPO. That occurred with urine in 2001. So, these things take time, what we found of more recent times though is that, taking EPO as an example, we're now into about the third or fourth generation of EPO style products. Remember, these are products made by the pharmaceutical industries for good and proper health reasons. So, there are products that the pharmaceutical companies are putting together on a regular basis and we need to keep up with what is being made available because the cheating athlete uses them for the wrong reasons. Kate - I mean, it's not just blood and urine tests for specific drugs that athletes have nowadays, but also these biological passports. What does that mean? Why were they introduced for the first time? David - Well, the biological passport was actually introduced and our suggestion by UCI in 2007, after a pretty unfortunate tour that year because it was a way of not only detecting whether athletes were using banned substances, but also a way for athletes to be able to put their hand up and say, "Look at my profile. It's normal." What it does is it collects results from a number of samples. You need 4 or 5 blood samples over a period of time so that you can look at the profile of any athlete, and you can see the spikes, the ups and downs in the profile. If they're not explicable by normal medical or health reasons then you have to look further and say, is this doping or is this a medical problem that the athlete has? And you conduct a medical inquiry into it. Kate - Some athletes do have naturally higher testosterone levels and things like that. How do you judge what's normal? David - Well, testosterone is another issue and what we've got now for testosterone is the ability through the steroid module to assess a testosterone level in an athlete. Again, it comes down to what is normal for that athlete. So, you're quite right to say it's very difficult to say what is normal across a whole human population around the world. What we have had in the past is a ratio of 4 to 1 between epitestosterone and testosterone which has proven to be two conservative because you might have a normal testosterone level of 1.5 and you can therefore cheat up to 4. So, what they do now is they look at their profile, gathered from urine testing and in the same way as I've just described the blood over 4 or 5 samples, look at what the normal TE ratio is. And if the athlete sits into that ratio normally then there will be no further inquiry. If he or she doesn't and there's a peak or a trough then we have an implement called a carbon isotope ratio approach and it automatically goes into that, tells you whether it's synthetic testosterone or not. Kate - Biological passports have been introduced in cycling for a while and they're becoming more popular in other sports. So, tennis took them on last year in 2013 and they're used up in the World Cup in Brazil for the first time this year. Why are some sports quicker to take on anti-doping measures than others? David - Well, I think because they're not mandated to. If somebody is told to, they will do it. If it's discretionary, people will do it when they feel that it fits their sport or suits their athletes and it's helpful for them. I think what we've found is that the take on the passport has taken a while. Therefore, people have been reluctant to use it unless they are sports where they've had let's call it problems or difficulties historically where they feel that the passport will be very useful. What we've seen now, particularly with football picking it up is that sport in general realises that this is a better way to go than just relying on urine collection alone. 57:09 - Why do breaking waves look white? Why do breaking waves look white? This week, we've been dreaming of warm sandy beaches while trying to answer this question from Emma and Greig Robinson from New Zealand. Emma - We're looking at the waves on Waikiki Beach in Hawaii at night. Wondering why the breaking waves are white. Where does the white come from? Thank you and we look forward to hearing your answer. Georgia - So, where does the white in breaking waves come from? We asked bubble expert, John Nees, a physicist and optics researcher at the University of Michigan who cleared the matter up with a little bit of help from his engineering student daughter, Clara. Clara - Like tiny ice crystals of snow, the tiny droplets and bubbles you see in the crest of a breaking wave appear right when they're grouped together even though they're transparent individually. John - Light scatters in many directions as it passes from air through its single droplet of water. Individually, each droplet scatters the surrounding light just a little bit, but collectively, the droplets scatter a great deal. Clara - This scattering mixes together all the different colours of light from the surroundings, blending them into white light. Georgia - So, coloured light bounces in and around tiny bubbles in the water which mixes together to look white. So, why do we see this effect in breaking waves, but not in calm water? John - It's important to note that light scatters when it passes between different materials such as water and air. The water in the ocean only meets the air at one surface, but the droplets in the surf meet millions of surfaces. So, they scatter the light more in a small area. Clara - That's why only the part of the wave that has broken apart appears white. John - Scattering makes the wave crest white with light from the surroundings. In some places though, there may also be light coming from inside the water. The crashing motion of the waves can agitate bioluminescent microorganisms. At night, you could see them glowing blue green in the surf. Next Is your sleep account in credit?